» Composite Materials Materials Research & Design, Inc.
As one example of a recent effort in process modeling, MR&D has been assisting in the development of non-eroding exit cones for solid rocket motors that use carbon-carbon substrates. MR&D has been specifically involved in the analysis of processing stresses to identify potential fabrication modifications that can reduce these stresses. The goal of this work is to recommend material design and processing changes so that the carbonization of a cured carbon/phenolic can be performed without creating delaminations. Results of these analyses have shown that reductions in cross-ply tensile stresses, which contribute to delaminations, can be achieved by increasing the shingle angle (angle of fabric plies to the axis of symmetry), which decreases pore pressure and reduces the thermal mismatch between the radial and hoop strains. Pore pressures result from the burning of the phenolic into a carbonaceous char, and can be greater than the strength of the material in some cases. The Process Environment Model (PEM) code was used to calculate the effect of various geometries, permeabilities, and boundary conditions on pore pressure. 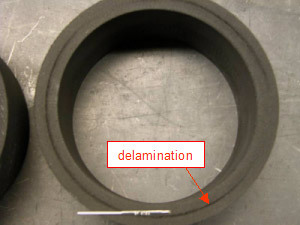 Other ways to reduce cross-ply tensile stress include reinforcement fiber architectures, the use of post-cure temperature cycles to reduce decomposition mass and increase permeability, and tailored carbonization cycles that provide slow heating rates at critical temperatures. Key results of this work have been published in proceedings of International Traffic in Arms Regulation (ITAR) restricted conferences. MR&D has received support from both NAVAIR and AFRL in the development of methods for enhancing the interlaminar (i.e., the across-ply tensile strength and interlaminar shear strength) of ceramic matrix and carbon-carbon composites. Company internal research and development funds have also been invested in the development of preform reinforcement for enhanced composite interlaminar strengths. Methods have included matrix modifications, but work has focused particularly on the development of modified fiber preforms for enhanced interlaminar properties. The goal of these efforts is to improve the composite interlaminar properties with as little impact as possible on composite in-plane properties. Results of the Government-supported research and development efforts have been published in ITAR-restricted conference proceedings. A paper on methods for enhanced interlaminar properties of carbon-carbon composites is part of the Carbon 2007 conference proceedings. Under a Phase I Small Business Innovative Research (SBIR) contract supported by the Materials Directorate of the Air Force Research Laboratory at Wright-Patterson Air Force Base in Dayton, OH, MR&D, teaming with Allcomp of Industry, CA, worked on the design and manufacturing issues associated with fabrication of a hybrid matrix composite consisting of a single continuous preform in which the matrix transitioned from a polyimide to a ceramic composition. The application for this composite material was associated with load-bearing thermal protection system (TPS) components; however, its use within parasitic TPS panel standoffs is also anticipated. A Phase II SBIR to continue the development of this product was funded in May 2007. Results to date of the Phase I design and fabrication activities have been published in ITAR-restricted conference proceedings. MR&D has had several government contracts for the development and benchmarking of ceramic matrix composite (CMC) life prediction analysis tools. Under a Naval Air Warfare Center (NAWC) Phase II Small Business Innovative Research (SBIR) Contract, MR&D continued the work of a Phase I SBIR contract to predict weight change due to oxidation kinetics and the subsequent modulus and strength degradation of CMC materials. Work continues on this contract to further develop and calibrate the models using measured data on this material system. The focus of this work thus far has been on SiC fiber, SiNC matrix composites for the flaps and seals of jet engines for naval aircraft. Under a NASA Contract awarded in 2007 as part of a NASA Research Announcement, MR&D is developing math model tools to predict the effect of oxygen partial pressures, temperature distributions, and stress state on the oxidation kinetics, mass loss, and stiffness and strength degradation of CMC materials. The primary materials of interest in the NASA contract effort are SiC/SiC and C/SiC materials for airframe and propulsion applications of hypersonic aircraft. The work performed on these contracts has been reported by MR&D engineers at ITAR-restricted conferences, for the peer review provided by forums of this type.